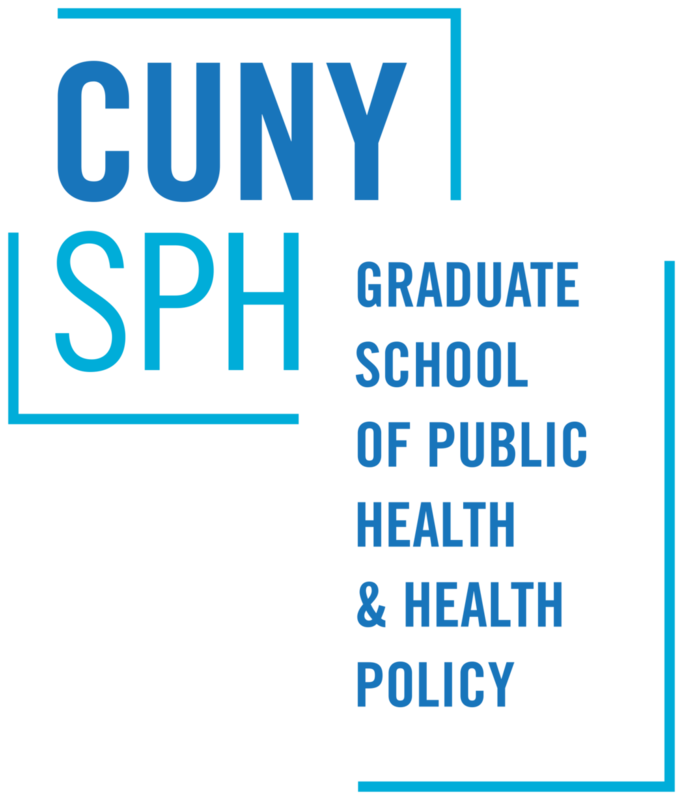 In spring 2018, Healthy CUNY and the CUNY Urban Food Policy Institute launched the CUNY Food Security Advocates Project to advance the goal of ending food insecurity among CUNY students. This demonstration project focuses on preparing students at John Jay College and Hostos Community College to become advocates who can take action to reduce food insecurity and hunger at their campuses. Students worked on a variety of projects that showcased the importance of addressing food insecurity by using print and other media campaigns. They also created a food justice alliance at John Jay, and facilitated cash and food donations to the John Jay and Hostos Food Pantries. The CUNY food Security Advocates Program is funded by the Jewish Foundation for the Education of Women. On April 30th, students at John Jay hosted a Food Justice Expo, where nearly 100 guests were able to learn about their work. Presentations and testimonials from students called for a greater understanding of food insecurity on campus, and table sessions from the students showcased ways that students and faculty could get involved. Moreover, students were able to sign-up those interested in joining the new Food Justice Club next semester. A proposal for a campus store that could accept SNAP payment was open for commentary, and students collected ideas for food items that could be available for purchase. John Jay Vice President for Enrollment Management and Student Affairs, Lynette Cook-Francis, shared some positive words about the students’ efforts to raise awareness about food insecurity on campus. The students also received support from Assistant Vice President and Dean of Students, Michael Martinez-Sachs, and Senior Director of Student Affairs, Dana Trimboli. More than 100 guests attended the Food Justice Expo on April 30th. (left to right top row) Food Advocates Stacy Espinoza, Emilie Quinones, Shadina Arnett, Raquel Guadalupe, Jasmina Kolenovic, Dean Sachs, VP for Enrollment and Student Affairs, Lynette Cook-Francis, Laura Blackwood, Professor of Food Justice, Robert Garot, Director of Health Services, Malaine Clarke, Director of Community Outreach Declan Walsh, and Senior Director of Student Affairs, Dana Trimboli. (left to right bottom row) Food Advocates Marleny Pimentel, Shannon Jensen, Ronnette Cox, and Brittany Applewhite. On April 19th Food Security Advocates at Hostos Community College collaborated with the Food Studies Department, the campus Single Stop office, and the Food Studies Club to start a month-long effort to provide food pantry giveaways on campus. Fresh greens and herbs were harvested from the campus’s 10 aeroponic towers, and the Food Studies Club donated $200 dollars in support of the pantry. In addition, the Food Studies Club purchased items like rice, dried beans, pasta, and canned vegetables to giveaway along with other items from the pantry’s inventory. Figure 4 Hostos Food Advocates Arlenny Cruz, Joel Rivera, Whitney Duncan, and Namizata Kamagate giveaway food items from the aeroponic towers along with rice, beans, and canned vegetables. Figure 5. Some of the items given away at the April 19th event. Hosted by the Food Studies Club, four additional food pantry events followed thereafter. Figure 6. Areoponic gardening towers were a way the students identified to address campus food insecurity this semester. Vegetables and herbs are ready for harvest typically in 6-8 weeks. 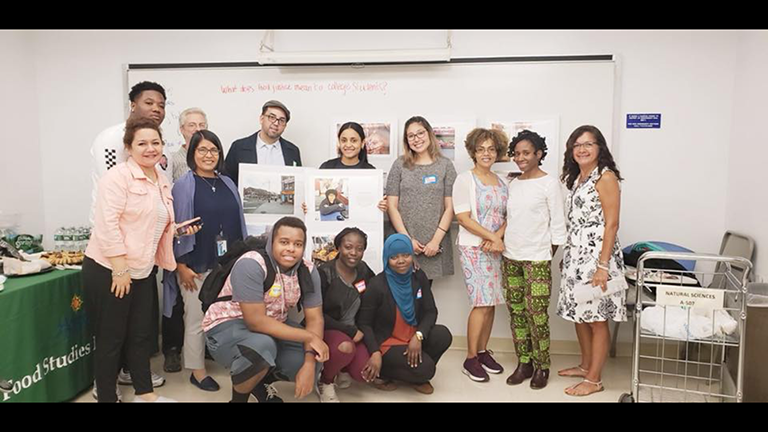 On May 2nd, Hostos Food Security Advocates presented photovoice projects to Professor Christopher Paskoff’s Food Studies 101 class. Students were asked to interpret two questions: “What does food insecurity mean to college students” and “What does food justice mean to college students?” In their interpretations, issues of urban food access, hospitality, stigma associated with food insecurity, and global food access, were among the themes that emerged. Professor Flor Henderson and Professor Iris Mercado were among the attendees. Figure 7. Hostos Food Security Advocates and guests who attended the May 2nd event. Figure 8. (left to right) Student Advocates Joel Rivera, Namizata Kamagate, Lazare Dada, and Arlenny Cruz, accompanied by CUNY Urban Food Policy Institute Project Coordinator Kathleen Delgado (center).